A senior presidential official raised the need to curb speculative demand in the property market Thursday, vowing to take stronger measures if needed. Jang Ha-sung, the presidential chief of staff for policy, made the remark at a meeting with senior officials from the government and the ruling Democratic Party over the economy. "The government will step up its efforts to thoroughly curb speculative demand in the property market while protecting real buyers," Jang said at the start of the meeting. "If needed, the government will consider introducing strong measures (to curb property speculation). We will take necessary steps to stabilize the housing prices and boost residential stability for ordinary people," he added. The government announced Monday that it has designated four districts in Seoul as "speculative" areas subject to stricter financial and other regulations in a bid to curb the overheated market. Apartment prices in Seoul, the capital of nearly 10 million people, have shot up in recent weeks following Seoul Mayor Park Won-soon's announcement in July of a plan to redevelop Yongsan and the financial district of Yeouido. He said Sunday he will suspend the plan. 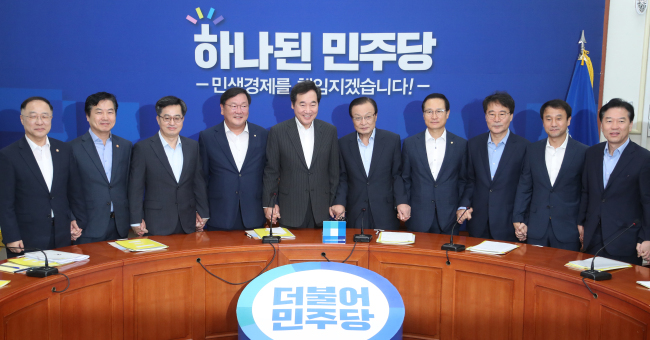 Lee Hae-chan, the chief of the DP, raised the need to raise real estate taxes for the owners of multiple houses or expensive homes, saying that bold policy responses are needed to stabilize the property market. "I see the need to strengthen comprehensive real estate taxes for the owners of more than three houses or high-value homes. I hope that the government will strongly consider the proposal," Lee said at his first meeting with key officials from Cheong Wa Dae and the government.